In 2001, a bronze disk with gold elements appeared on the “black market” of German antiques. 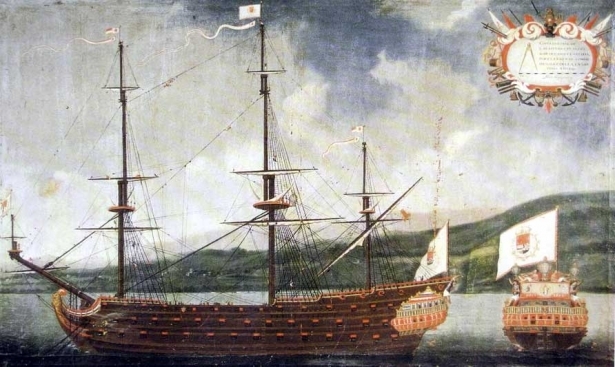 Connoisseurs of artifacts have not previously seen analogues among the discovered treasures. Of course, the disk attracted the attention of the authorities. Police arrested the sellers for the attempt to sell the disk for profit. According to German laws, objects that represent archaeological value belong to the state. The criminals were punished, and the ancient jewel was given to the scientist for detailed examination. 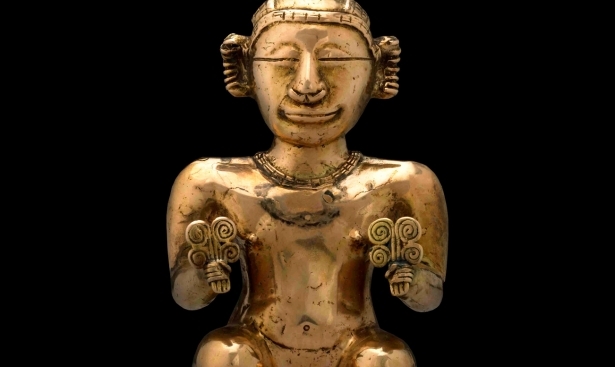 In the photo: Nebra’s treasure has been resold on the black market several times. Its price grew from 10.000 to 400.000 euros. 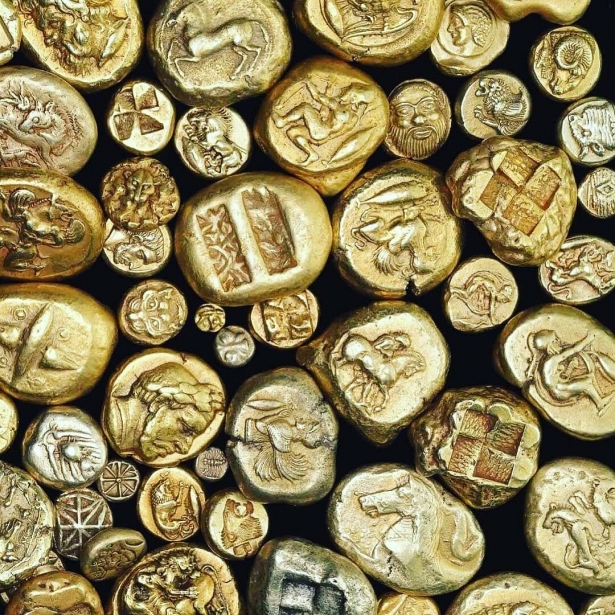 It turned out that the treasure was found in Nebra, fifty kilometers from Leipzig. Archaeologists have found an ancient burial where they found bronze objects: two daggers and an ax, bracelets in the form of spirals, a chisel. There was also a disc with golden arcs. 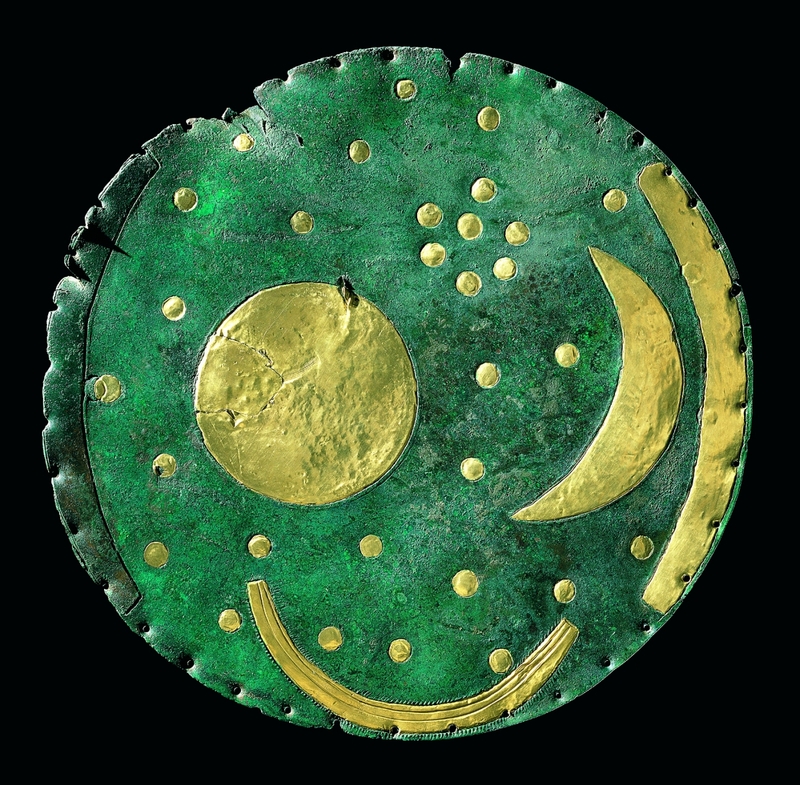 The bronze Nebra sky disk is covered with a blue-green patina. There are gold plates depicting the starry sky on its front side. The sky background is covered with 32 stars, the sun and the crescent moon. On the right side, along the edge of the circle, a strip of gold is attached. Below is an arc which depicts a boat, according to scientists. The size of the disk is rather small: diameter - 30 cm, thickness - 3 mm. In the photo: a valuable item has been restored by the museum masters: a golden patch was placed on the image of the Sun. Experts have determined the age of the artifact - 3600 years old. This discovery was a sensation at its time: archaeologists have never discovered treasures with the image of stars or anything quite like it. Scientists have concluded that astronomical observations were of great importance to people during the Bronze Age. Historians sill argue over the sky disk’s purpose. Some consider this mysterious object a sky map, others as a primitive navigation device, while many people think that it is the lunar calendar. All scientists agree on one thing, associating the artifact with the exploration of celestial bodies. Interestingly enough, 20 km from the place where archaeologists discovered the disk, a no less sensational discovery was made earlier. It was an ancient astronomical observatory. 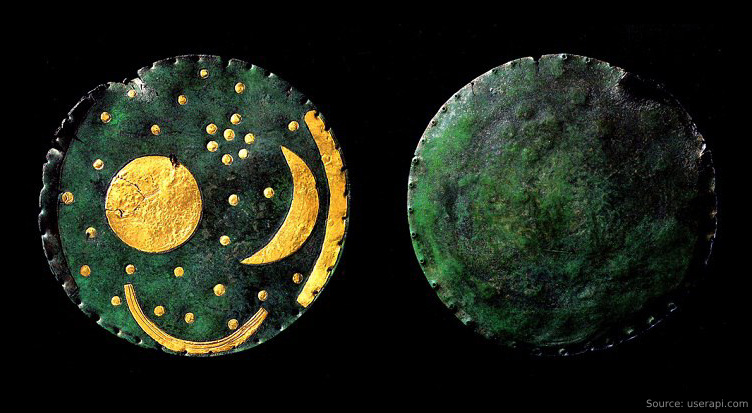 The sky disk has been stored in the safe of the State Museum of Prehistory in Halle, Germany. A multimedia exhibition dedicated to the famous artifact has been showcased in Nebra. 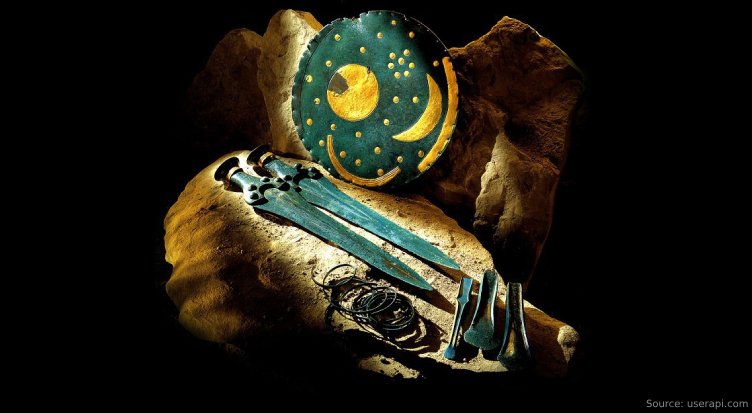 The image of the Nebra sky disc is massively popular in Germany. Every two or three times a year, the German court deals with cases regarding the permissible use of the copyrighted disk image for commercial purposes. In 2008, the State Bank of Germany (Staatsbank) issued a commemorative 10-euro coin with the image of a treasure. The market value of the disc with a golden application is estimated at 100 million euros. More gold news: learn about the Golden Jewel of Winchester University.